Leo Cullen’s men led 22 – 0 for much of the second half, but were unable to claim a fourth try. IT WAS ANOTHER impressive fay from Leinster’s young guns, but despite shutting out Ulster for almost 77 minutes, the eastern province’s New Year’s Eve celebrations will be tempered by the absence of a bonus point with this comfortable victory. With Paddy Jackson among the rested Ulstermen, both sides had makeshift 0ut-halves, but the less-experienced Ross Byrne looked more comfortable than the out-of-position Springbok Ruan Pienaar. 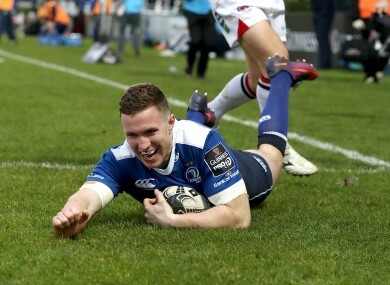 Rory O’Loughlin tries either side of one from Luke McGrath looked set to bring Leinster a bonus point victory with Ulster struggling to put phases together. However, after a 42nd minute try, the RDS faithful had only defensive resolve to cheer about as Les Kiss’ side found their feet. The hosts took the lead thanks to a clinical set play just seven minutes in. O’Loughlin ghosted onto a pass from Ross Byrne and, once through the line, kept his head up and feet whirring. The 22-year-old could have froze when faced with the covering Andrew Trimble, but he cut left and burnt off the Ireland wing and Paul Marshall as he raced to the corner. Isa Nacewa made use of the swirling wind to curl over the touchline conversion, and the element aided Leinster at the other end minutes later when Pienaar’s second penalty attempt veered to the right of the posts. If there was luck in the mix for Leinster — and Ulster should have reeled the gap in to 10 – 7 only for Tommy Bowe to drop the pill with the try-line begging — but they were making much of it themselves with bright footwork with the ball in hand and ferocious tackling led by Hayden Triggs and Garry Ringrose when the neighbours from the north did threaten. In the first-half though, it was the set-piece plays which provided the incisive cutting edge. On 32 minutes, the Blues took advantage of Rob Herring’s injury absence with another left-flank line-out as Sean Cronin fizzed the ball to scrum-half Luke McGrath at full tilt and he was diving over the line with the white pack utterly flat footed 20 metres back. Ulster emerged for the second half with a 17 – 0 deficit to face up to and they managed to put some solid phases of pressure together. Though that was only after O’Loughlin’s try-scoring smile was on show again thanks to Byrne’s stabbed grubber into the left corner with the second half not yet two minutes old. Jack McGrath earned a yellow card as Ulster began to dominate the second half territory. However, even an extra man couldn’t stop the visitors’ attack stuttering and the blue defence looked set to complete a shut-out until Charles Piutau broke through late on to save some blushes for his side. Email “O'Loughlin shines to beat Ulster, but Leinster leave bonus point behind”. Feedback on “O'Loughlin shines to beat Ulster, but Leinster leave bonus point behind”.